If you’re a wine aficionado, you’ll be drooling over this 4-bottle wine saving system by WineKeeper. WineKeeper makes devices that preserve and dispense open bottles of wine. If you’ve ever wanted to open a special bottle of wine, but haven’t felt up to finishing the whole thing at once, you’ve faced the dilemma of many wine collectors. You don’t want to leave a bottle open to lose some of the precious flavors you’ve been looking forward to, yet you don’t always want to down an entire bottle in one night. If you’ve ever wanted to savor a bottle over a couple of nights, you might think about investing in a wine preservation system. 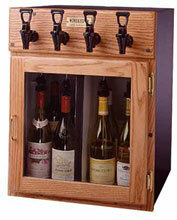 This Napa 4-bottle WineKeeper is a great option for the home wine collector. Here’s how it works: piping connected to each wine bottle dispenses nitrogen, replacing the oxygen in the tops of the bottles with this non-reactive gas. While oxygen will interact with the chemicals in the wine, changing the way the flavors taste and pushing the wine towards rancid, nitrogen doesn’t. Your wine is preserved in perfect condition, allowing you to drink it at your leisure. When you’re ready to enjoy your wine, the WineKeeper smoothly dispenses it into your glass. In addition, the WineKeeper keeps your wines at the correct temperature, and this model even comes with dual temperature zones, so you can store both whites and reds perfectly at once. Perfectly kept wine, always at hand? Sign me up!